Genome edited (GE) crops will be sown in a field this month for the first time in the UK as part of an experimental trial at Rothamsted Research that aims to investigate genetic engineering's efficiency in developing plants to yield more nutritious diets more sustainably.Like traditional plant breeding, genome editing can create new varieties of plants with desired traits by altering their genetic code in a way that could have happened naturally or that does not incorporate genes from another species. Unlike traditional methods, the new technology is more accurate and can cut development times from decades to months, says Johnathan Napier, a leading pioneer in plant biotechnology at Rothamsted and an advocate for the power of genetically modified (GM) plants to deliver for the public good. Plans to start sowing two GE lines of Camelina plants follow official approval of Rothamsted's application to grow GM varieties of Camelina plants engineered to accumulate omega-3 long chain polyunsaturated fatty acids (LC-PUFAs), a form of lipid that are also known as omega-3 fish oils, in their seeds. While GM plants require approval before they can be grown in the field, GE varieties do not necessarily. The crucial difference is between mutations that incorporate DNA from a different species, transgenes, and those that do not. The GM Camelina incorporates new (algal) genes; the GE varieties involve only changes (losses) in the plant's DNA material. "These two technologies promise much," says Napier, who leads Rothamsted's Omega-3 Flagship Programme. "The GM plants should yield superior levels of [LC-PUFAs] EPA and DHA; the GE plants will improve our understanding of lipid metabolism." Approval of the GM field trial came from the Department for Environment, Food and Rural Affairs (Defra) following advice from its Advisory Committee on Releases to the Environment (ACRE), which is charged with ensuring the safety of novel organisms outside the laboratory. ACRE also considered the GE varieties, which were produced by a technique known as CRISPR-Cas9 (clustered regularly interspaced short palindromic repeats, using CRISPR associated protein 9). While use of the Cas9 protein (from a different species, to change genetic coding) involves GM, no remnants of the transgene are present in the final plant. Nevertheless, the plant retains the changes to its DNA brought about by the genome editing technique. The committee concluded: "It would not be possible to determine whether these lines had been produced by genome-editing or by traditional mutagenesis because they would be genetically indistinguishable." Traditional mutagenesis is covered by a "mutagenesis exemption" from EU regulations that restrict the release of genetically modified organisms (GMOs). A more general clarification came from Defra Minister George Eustice in a parliamentary written answer in March: "Where gene editing results in an organism with DNA from a different species it will be regulated under the controls for genetically modified organisms. However, the government's view is that specific regulation of this technology is not required where the induced genetic change could have occurred naturally or been achieved through traditional breeding methods." The approved field trial at Rothamsted comprises 20 strains of Camelina sativa: 17 GM lines, two GE lines and one wild-type, or control line. The GM lines have been modified primarily to accumulate EPA (eicosapentaenoic acid) and DHA (docosahexaenoic acid), the so-called "fish oils" that are essential for healthy diets but whose supply is threatened. Other GM lines have been modified to produce the ketocarotenoid, astaxanthin, or wax esters, both useful compounds of otherwise limited availability: ketocarotenoids are high-value, antioxidant pigments; wax esters are stable, biorenewable alternatives to petrochemically-derived lubricants. "We have synthesised the genes involved in the novel GM production of these useful compounds," says Napier. "They are based on the sequence of genes found in a range of different organisms, including photosynthetic marine organisms, such as algae, and other lower eukaryote species, such as mosses and oomycetes; transgenic Camelina provides an alternative production source for these useful lipids." The Rothamsted team has also developed GM lines to study two traits related to plant architecture: stem thickness and photosynthetic capability. The goal is to improve Camelina as a crop. 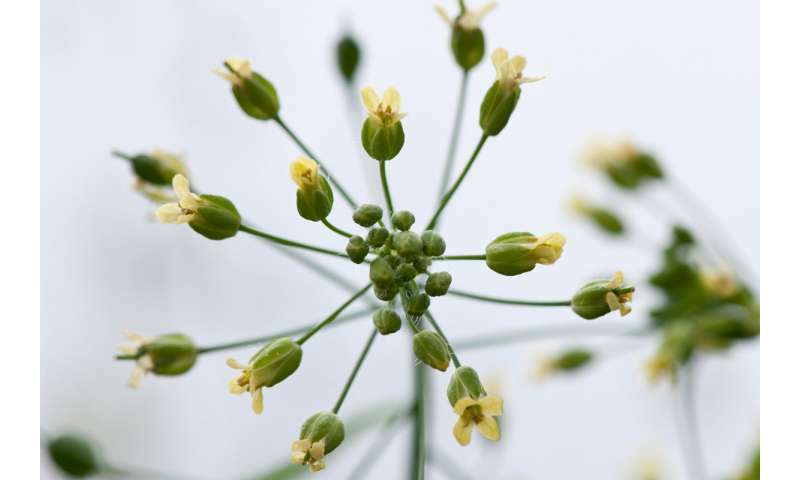 For the two GE strains of Camelina, Rothamsted is collaborating with a French team led by Professor Jean-Denis Faure, Professor of Plant Embryogenesis at INRA's Versailles-Grignon Research Centre. The distinction between GM, which introduces genetic coding from unrelated species, as algal genes are introduced into Camelina plants to produce fish oils, and GE, which changes genetic coding without leaving unrelated material behind, is a live debate in Europe. Since January, the European Court of Justice has been considering a legal opinion on a case, led by a French agricultural union and backed by environmentalists, that seeks to broaden the scope of GM regulations to include new breeding techniques. "Since 2015, France has not authorised the release of genetically altered plants in the environment for research, having adopted the "opt out" provision of the most recent EU directive," notes Napier. "So, in part, we're helping out our colleagues in France by including these two GE lines of Camelina in our trials. And it'll be useful to see how the CRISPR-edited Camelina performs in the field." One significant difference with the GE technology is that the genetic changes are expressed in every cell, in all parts of the plant; the GM changes are confined to the seeds, due to the restricted expression of the inserted genetic material, or transgenes. Napier adds: "The field trials will allow us to assess how we might use CRISPR in tandem with the GM gene constructs that we have designed, tested and developed at Rothamsted. Both technologies could have a huge impact on the sustainable intensification of agriculture for the benefit of all."